The United States and China will resume trade talks next week in Washington with time running short to ease their bruising trade war, but US President Donald Trump repeated on Friday that he may extend a March 1 deadline for a deal and keep tariffs on Chinese goods from rising. 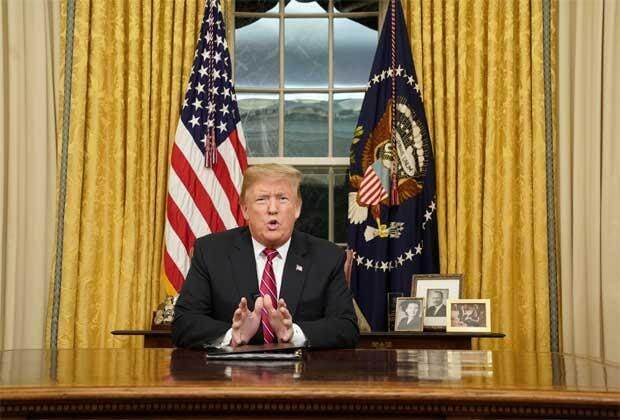 Trump, speaking at a White House news conference, said the United States was closer than ever before to "having a real trade deal" with China and said he would be "honoured" to remove tariffs if an agreement can be reached. But he added that the talks were "very complicated." White House Press Secretary Sarah Sanders said in a statement on Friday the two economic superpowers "will continue working on all outstanding issues in advance of the March 1, 2019, deadline. "These detailed and intensive discussions led to progress between the two parties. Much work remains, however," Sanders said about the Beijing talks. She added that the two countries agreed to state any commitments they make in a memorandum of understanding. Trump, asked whether he would grant Beijing a 60-day extension to the deadline, said: "There is a possibility that I will extend the date. "But if I do that - if I see that we're close to a deal or the deal is going in the right direction - I would do that at the same tariffs that we're charging now, I would not increase the tariffs." The conclusion of the Beijing talks prompted optimism on Wall Street, where major stock indexes were broadly higher, led by financial services shares. The U.S. China Business Council, which represents American companies doing business in China, applauded the announcement that the two sides would put specific language in a memorandum of understanding. "Any agreement must be detailed, enforceable, time-bound, and result in market-access improvements that have a meaningful impact for American companies, workers, and farmers," the group's president, Craig Allen, said in a statement. Chinese state news agency Xinhua said on Friday that China and the United States had reached a "consensus in principle" on some key issues, adding they had a detailed discussion on a memorandum of understanding on trade and economic issues. It gave no details. The countries focused this week on technology, intellectual property rights, agriculture, services, non-tariff barriers and currency, and discussed potential Chinese purchases of U.S. goods and services to reduce a "large and persistent bilateral trade deficit," Sanders said. Chinese President Xi Jinping met U.S. Trade Representative Robert Lighthizer and U.S. Treasury Secretary Steven Mnuchin on Friday after a week of talks at senior and deputy levels, and called for a deal both sides could accept, Chinese state media said. After talks on Thursday, Mnuchin said on Twitter that he and Lighthizer had held "productive meetings" with Xi's top economic adviser, Vice Premier Liu He. "The consultations between the two sides' teams achieved important step-by-step progress," Xi said, according to state television. "I hope you will continue efforts to advance reaching a mutually beneficial, win-win agreement," Xi said at Beijing's Great Hall of the People. He added that China was willing to take a "cooperative approach" to settling bilateral trade frictions. Lighthizer told Xi the senior officials had "two very good days" of talks. "We feel that we have made headway on very, very important, and very difficult issues. We have additional work to do but we are hopeful," Lighthizer told Xi in a pool video shown to foreign media. Although Trump said this week that an extension of the tariff deadline was possible if a "real deal" was close, Larry Kudlow, director of the U.S. National Economic Council, has said the White House had made no such decision. "Stalemate on the important stuff," said one source. All of the sources requested anonymity because the talks are confidential. "There's still a lot of distance between parties on structural and enforcement issues," said a second source. "I wouldn't quite call it hitting a wall, but it's not a field of dreams either." A third source told Reuters the White House was "irate" over earlier reports that the Trump administration was considering a 60-day extension of the tariff deadline.